An obvious weakness of the ESP8266 is the limited capability of it’s single ADC input. At best, the voltage range is 0-1 Vdc. While coupling an Arduino module to the ESP8266 solves this problem, is does introduce significant data acquisition delays for the Arduino-to-ESP8266 communication. A preferred solution uses the ESP8266 without requiring an additional processor. The method presented here adds 4 ADC inputs, each supporting voltages from 0-5V. In addition, one true DAC output is available to replace the PWM feature used for that purpose. And no additional processor is required. This is a very inexpensive addition, requiring hardware that acquired for approximately 1 USD. 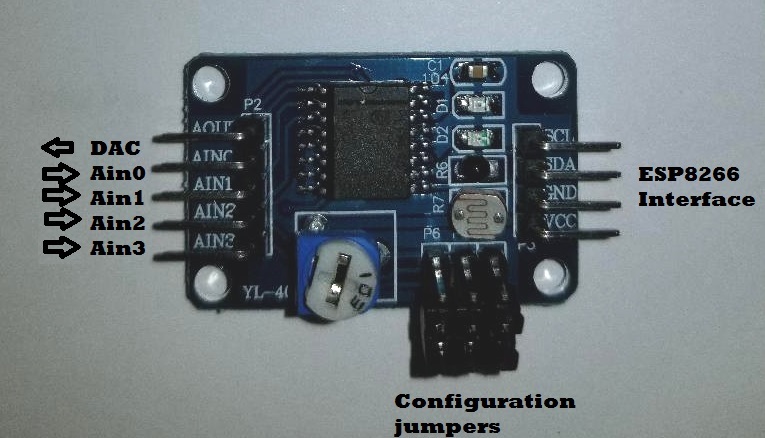 The enhancement is achieved by adding an external i2C bus ADC device to the ESP8266 system. This module, PCF8591, was added to my project recently, purchased from Ali-Express for 93 cents. It sports 4 ADC channels, one DAC channel, a potentiometer, thermister, and a photo-sensor. But for my needs, I have disabled the additional components and use it strictly as a 4-channel ADC. The device uses an i2C bus, which requires 2 digital pins (any two) to operate. There are two limitations I discovered while testing this module, neither of which adversely impact it’s functionality in my application. 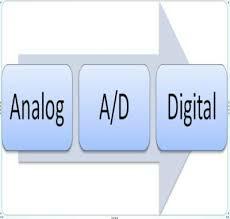 The ADCs and DAC are 8-bit devices. This results in a somewhat course resolution of 19mV-per-bit when using a 5V reference. The DAC range is linear 0-4Vdc, but compresses beyond that and tops out at 4.25Vdc. Even with these constraints, I was still pleased to have the capability of measuring voltages 0-5V. This was a huge improvement over the ESP8266 native 0-1Vdc ADC. The jumper pins (P4-P6) are removed for 4-channels ADC configuration. Here is the minimal Arduino sketch I used to test this ADC. As you can see, the ADC read code can easily be included in a more complex sketch. Wire.beginTransmission(PCF8591); //Calls the 8591 to attention. Wire.write(PCF8591_DAC_ENABLE); //Send a DAC enable word. adc_value = Wire.read(); //This needs two reads to get the value. 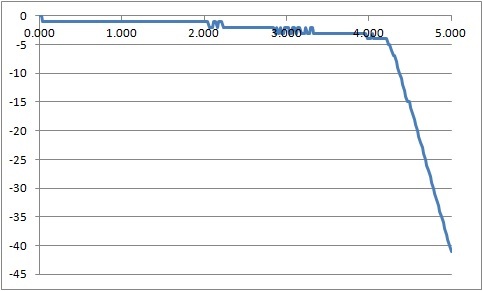 The ADC measured values deviate from the DAC setting by no more than 1 bit (~ 20mV) from 0-2 Vdc. This deviation increases to 4 bits around 4 Vdc, with the DAC output topping out at about 4.2 Vdc. From this we can conclude that the DAC has a functional range from 0-4 Vdc with an error no greater than 4 bits (80mV). Not super accurate, but it is adequate for many applications. I measured the ADC output with a DVM (digital voltmeter) to confirm the DAC output never exceeded 4.2 Vdc. And to confirm the ADC has a full range of 0-5VDC (0-255 byte value), I applied 5 Vdc to one of the Ain inputs and verified the measure value as 255 (5 Vdc). I also used the built-in potentiometer to swing the ADC measurements between 0 and 255 (0-5 Vdc). With a slight modification to the sketch to display the ADC readings from the potentiometer (Ain3) in Vdc, we observe good correlation between the applied voltage and the ADC measurement. This confirms the ADC can read voltages over the full 0-5 Vdc range. The PCF8591 ADC has 3 programmable address lines which makes it possible to expand the ADC channel count from 4 to 32. Even better, this still only requires 2 ESP8266 digital (GPIO) channels as the control pins would all be connected in parallel. But there is a catch with the XL-40 carrier module that holds the PCF8591. The 3 address lines are hard-wired to ground. 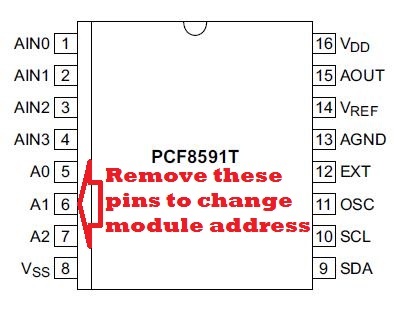 So, to expand the channels, you would need to cut the traces (lift the pins) to set a different address for each added module in your ESP8266 configuration. No impossible, but you have to be careful not to overheat the device when desoldering the pins. Here is a low-cost (1 USD) addition to your ESP8266 setup that expands the ADC capability to 4 channels with the bonus of a real DAC output. While the DAC is limited to a 0-4Vdc range, you have the full 0-5 Vdc available for analog measurements with reasonable accuracy. Hope you find this a useful addition to your projects. Uttering Alexa voice commands to turn your ESP8266 connected device on or off is cool. There is plenty of information readily available explaining how to make that happen. But what a custom command? Like having Alexa tell you something unique. Using data gathered by reading your specific IoT device sensors? Such as ESP8266 measured values that change over time. For example, temperature or other weather sensors. Having the ability to interact verbally with your IoT device in this manner opens up a wide range of possibilities. Yet, as I discovered, information on this topic was more challenging to find with a google search. What is needed is a method of converting your verbal request into a command that can be sent to your ESP8266 (or other IoT device) to get the requested information, and to return the information to Alexa in a format that she can read back to you. 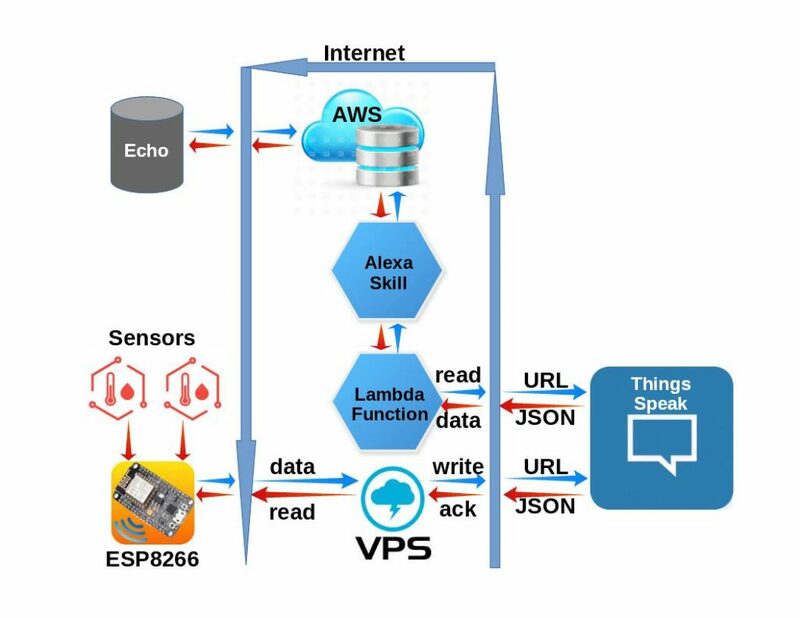 The solution presented here uses the Amazon Web Services (AWS) to do all the voice interfacing with Alexa, Things Speak as a repository for the ESP8266 sensor data, and a VPS CRON script to move the sensor data from the ESP8266 to Things Speak. You might wonder why a VPS and Thing Speak are used. 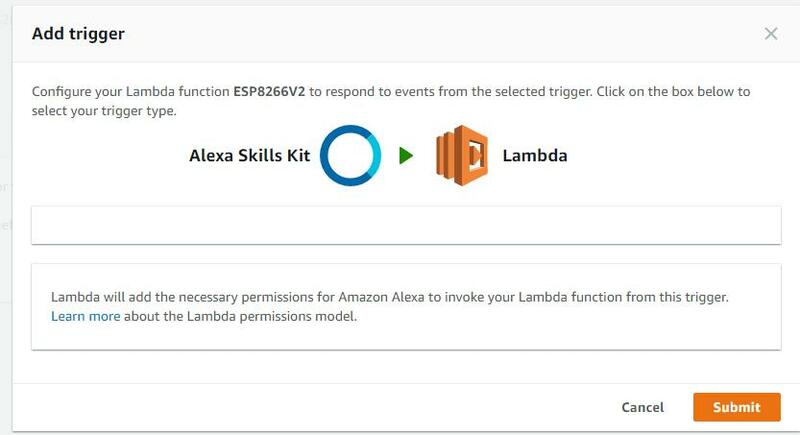 Why not communicate directly with the ESP8266 from the AWS Lambda Function? Truth is, you can cut out these intermediate steps. But for security, I have added this layer to hide my IoT credentials within my heavily fortified Virtual Private Server (VPS). But do not be concerned, as you will see, this does not make the system overly complicated. Since we are dealing with the Amazon Echo device, Amazon lingo is needed (bold). The voice command was received by the Amazon Echo device and recognized as an Alexa skill. The readings returned were passed back to the Alexa skill which recites the values of the temperature sensors. We need three components to make this system function as intended. Sign in to https://developer.amazon.com/ and go to the Developer Console. Select “Get Started” Alexa Skills Kit. Then click “Save” at the bottom. Then click “Add” below the “Enter Values” box..
Now click “Save” at the bottom. Click “Save” at the bottom. Then click “Next” at the bottom. 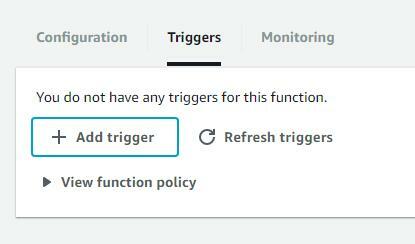 * It is a Lambda function for handling Alexa Skill requests. * User: "Alexa, ask ESP8266 for temperature readings"
* Alexa: "Indoor temperature is 75.2 degrees and outdoor temperature is 86.2 degrees"
* ESP8266 is a child of AlexaSkill. * Overridden to show that a subclass can override this function to teardown session state. * Get all sensors temperatures and return speech to the user. // Create an instance of the SpaceGeek skill. "text": "Attic temperature is 49.2 degrees"
The actual temperature readings will vary, depending on the current temperature in my attic. You should now be able to invoke this skill using your Amazon Echo using voice commands. Select “Skills” and then “Your Skills”. This new skill should be listed and enabled. Uses a Linux CRON script scheduled to run at the start of every hour. As you can see, you can make the information collected by your IoT device, such as an ESP8266 accessible via audio commands/responses using the Amazon Echo device. The commands and responses can be customized to the exact words you wish to use. This opens up infinite possibilities. Hope you find this information useful and fun to explore.